"You will never meet a family like the Grahams. Ed was a Marine and after 911 joined the National Guard. Dorothea served in the Army. The have a blended family with his, hers, adopted and foster totaling 11 kids in the home. Every child that enters their home is welcome no matter if they are natural born, step, foster, adopted or a neighborhood kid. Ed was injured in Iraq; his back was broke in 3 places along with many other injures, and an IG complaint was filled to get him out of Iraq to come home to receive medical treatment. He then was unemployed before being hired at a Wounded Warrior Workshop by the Center for Disease Control. This put a burden on the family and their house and 18 acres of land were foreclosed on forcing their large family to relocate to a smaller home that is in need of repair. This has caused a finical burden on the family because of payments that they have to make for him to be seen at outside doctors' offices. This family has not been on vacation in nine years and very deserving. 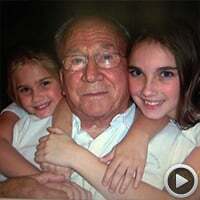 They are a very proud military family." WSB-TV chose the top 5 finalists from entries submitted and then the public voted for the winner on wsbtv.com. Montlick & Associates is happy to provide the Graham Family with a much-deserved paid vacation! My dad, like most, is an amazing man. He is a WW2 vet, 86, has already retired off 2 jobs. One in the Navy, one as a professor, and now working on #3 as a building official in Greene County! He takes no meds and never misses a day of work. Yet he has plenty of vacation time :) These two girls (my daughters) beside him thinks he hung the moon and stars, and so do I. My mom is just as amazing. She is..69ish..lol we aren't sure. She is retired but works for us full time cooking, gardening, with our church, and taking care of this amazing Vet! My Dad has continued to serve on many boards including VFW, American Legion, and has many been given many accolades for his services in many areas of his life. He is a true patriot and we are loosing these wonderful service men/women too fast. I would love to see my Dad go on a vacation with his family and be honored by Montlick and Associates before he is another vet, by the American people, not us, that is forgotten! They all deserve a vacation in my opinion! My Dad can't usually talk to much about the stories he has lived through, but the ones he has, these men that serve are heroes and we should NEVER let them be forgotten for our freedom they continue to give us!! 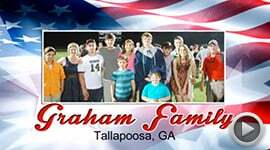 You will never meet a family like the Grahams. Ed was a Marine and after 911 joined the National Guard and Dorothea served in the Army. The have a blended family with his, hers, ours, adopted and foster totaling 11 kids in the home. They have fostered teenagers for 6 years. Any child that enters their home is welcome no matter if they are natural born, step, foster, adopted or a neighborhood kid. They know the Graham's will help them in any way that they can. Ed was injured in Iraq and continues to suffer every day. His back was broke in 3 places along with many other injures, but an IG complaint was filled to get him out of Iraq to come home to receive medical treatment. He spent a couple of years in medical hold before he was able to come home. He then was unemployed before being hired at a Wounded Warrior Workshop by the Center for Disease Control. This put a burden on the family and their house and 18 acres of land were foreclosed on forcing their large family to relocate to a smaller home that is in need of repair. Ed has had a hard time with getting appointments at the VA hospital. This has caused a finical burden on the family because of payments that they have to make for him to be seen at outside doctors' offices. Dorothea was stationed in South Korea where she was exposed to copper poisoning in the water. Her 3 oldest kids have learning disabilities because of the poisoning and the VA would not help when she was discharged. This family has not been on vacation in nine years and very deserving. They are a very proud military family. This is a photo of my parents, SSG. Joe and Jan Johnson. My Dad is Ga. National Guard but is currently in the Wounded Warrior Unit at Ft. Benning, Ga. He was injured while on deployment in Kosovo. Let's back it up a few years ago though. In April, 2004, my youngest brother, SPC. Justin Johnson was killed in Iraq. Even though our family went through this, my Dad still deployed twice to Iraq with my Mom's support. While he was over there, my Mom was serving here with the Patriot Guard Riders, standing for all of our Fallen Heroes and Veterans, making sure their families were taken care of. Those families will attest to how much help she was to them during that sad time in their lives. She has supported the Canton Armory as their Family Readiness Group coordinator for several years, even after my Dad left that armory and joined a new one. 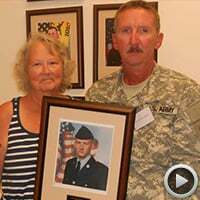 She has helped support all local military organizations in and around the Rome, Ga. area. While my parents could have crumbled after my brother was killed, they stood strong and supported everyone who needed it. My Dad is about to be discharged out of the military because of his injury he received in Kosovo. This would give them something to look forward to when he is out. 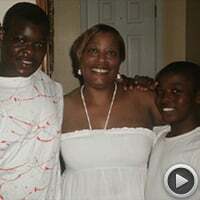 This military mom is a single parent of 3 wonderful boys. She served during desert storm where she sustained injuries that would stay with her for the rest of her life. Although she is going through bouts of depression, and PTSD, with the help of our family she is the best mother that I could think of to nominate for this opportunity. Not many women veterans are recognized for their service, I hope that you will recognize Sunceree Ravenell so that she knows that she is appreciated and not alone. Thank you. 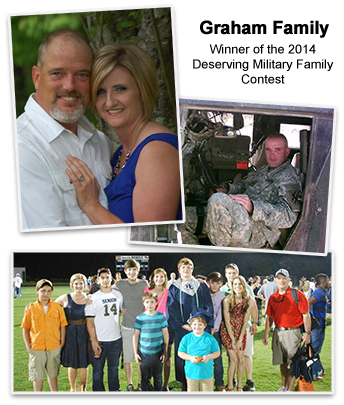 The Tajjiou-Noble Family has been serving in the United States Army for over 18 years now. After a four year deployment to the Middle East, MAJ Noble served as an Advisor to the Saudi Arabian Air Defense Forces providing guidance and assistance to their air defense systems in theater. During this time, Amal Tajjiou-Noble homeschooled her children and maintained a volunteer support group with other wives in the community. She volunteered over 500 hours assisting other military wives with drivers training, English as a second language training and teaching children in the community Arabic and Islamic studies at the local masjid. The family spends quality time together and have dinner everyday together as a family. 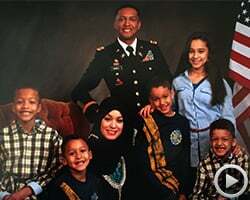 While MAJ Noble was deployed, he stayed connected to his wife and children through making video tapes of himself reading stories to his children and letters to his wife. MAJ Noble comes from a military family where his Father just retired from the United States Army after serving 41 years in service to his country. MAJ Noble is also currently completing his PhD in Clinical Psychology from Walden University.